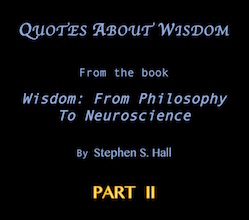 This blog is third in a series of three blogs which feature wisdom quotes and words of wisdom from the very capable author of Wisdom: From Philosophy to Neuroscience, Stephen S. Hall. He is a science writer for magazines like TNew York Magazine and Scientific American. In this dense yet fascinating book, Hall gives the reader a look into the origin, nature, and scientific findings about wisdom. It is an integrative and enlightening book. I researched it thoroughly, and pulled out many of the best and most succinct wisdom quotes it has to offer. As a proponent of the research ideal, philosophical thinker, and voracious reader, I found the book quite entertaining. There are hundreds and hundreds of potentially life-changing quotes out there, and this blog is an attempt to bring just five to the fore for your consideration. Sit back, relax, slow it down, and let these enter your mind, and your heart. They are, as I believe, potentially life-changing quotes because they have the potential to provide a breath of fresh air in our busy, crowded, frustrating, isolating, difficult, money-centered society. These thoughts by some great thinkers from the past and present have the potential to wake us up, elicit great insight and enthusiasm, and help us integrate the often-separated and truncated parts of ourselves. Some Montaigne quotes, such as the following, are abstruse and unwieldy: “Difficulty is a coin which the learned conjure with so as not to reveal the vanity of their studies and which human stupidity is keen to accept in payment.” Other Montaigne quotes are as accessible, substantive, and as beautiful as a ripe peach: “It is only a fool who never suspects he could be foolishly mistaken.” His study of “the ancients” as well as his own works place quotations in their proper place: upon high. This blog is a compilation of some of the pithiest and profoundest Montaigne quotes humanity is in possession of. Thank God. Or Apollo. Or our lucky stars. What is meant by the phrase values of the wise? I admit, it isn’t as intuitive as a phrase such as the values held by wise people or even that which those who are wise find valuable. But that is what it is meant to convey. When I see a person who is careful, open, clever, developed, self-controlled, passionate, lighthearted, loving, and perceptive, I think: wise. Wisdom. This blog features twenty unique and incisive quotations which illustrate values. Not just any values: values of the wise. Stephen S. Hall put out a very complete and (to me) compelling book entitled Wisdom: From Philosophy to Neuroscience. In it, he does a fine job of laying out a history of the subject, some of the hallmarks of what it is and what it isn’t, and brings some scientific findings in to enlighten and broaden the view. In this blog, I share some information considered to be “reviews” and then include many quotes about wisdom from the book. These are little-known, broad, intelligible, useful quotations, so I hope you appreciate them and add them to your collection. Oh, and read the book! Values of the Wise features 30,000+ interesting quotes about values, and they keep coming! Every week I’m reading, discussing, learning, copying, recording, and the like. This ongoing effort is the fountainhead from which all these diverse and compelling quotations come. What words describe the following interesting quotes about values and wisdom? Diverse. Unique. Little-known. Classic. Liberal. Trenchant. Controversial. Transcultural. Apt. It is my hope that you will appreciate these challenging but interesting quotes about values, and use the quotations database I call The Wisdom Archive to customize your search for more! “Memes” are graphic images with a very small amount of text. You see them commonly on FB, and can be funny, trenchant, pithy, catchy, and evocative. I tend to make my memes with a bit more wording, and really consider them to represent values and wisdom. In the following blog, I show some of the memes I have made over the last year or two, and point out how the quotes about values and wisdom depicted can really be made scintillating and compelling when coupled with graphic imagery. Enjoy!